1. Initially on the Phone. 2. In the Dental Chair with the Dentist. • Find out what the caller is concerned about and why. • Ask questions to build concern. 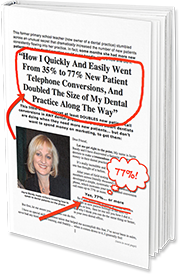 • Create urgency by letting the caller know what will happen with no treatment. • Wait and let the caller ask what type of Appointment they need. • Give a brief outline of the Appointment and what they can expect. When you make an appointment, you need to ensure that the caller is ready to start treatment and is fully committed to their Appointment.